Nellie Carter’s scrapbook was a Christmas present from her colleague Charlotte Skinner. As a member of Queen Alexandra's Imperial Military Nursing Service (QAIMNS) she would go to France, Gallipoli, Salonica and Egypt during the war. Everywhere she went she took her scrapbook with her. In it she recorded her patients' and colleagues' poetry, illustrations, stories and jokes. Ellen Mary Carter was born in Portsmouth on 3 March 1881 to Joseph and Nancy Carter. She had four younger brothers, William, Harry, Benjamin, Herbert and one younger sister, Rosa. All of Carter’s brothers would fight in the war. Ellen Mary Carter was born in Portsmouth on 3 March 1881 to Joseph and Nancy Carter. She had four younger brothers, William, Harry, Benjamin, Herbert and one younger sister, Rosa. All of Carter’s brothers would fight in the war. Carter Family. Top row, left to right: William, Harry, Nellie, Benjamin, Herbert. Courtesy of Peter Carter and Family. Were ever I am I remember you yet. 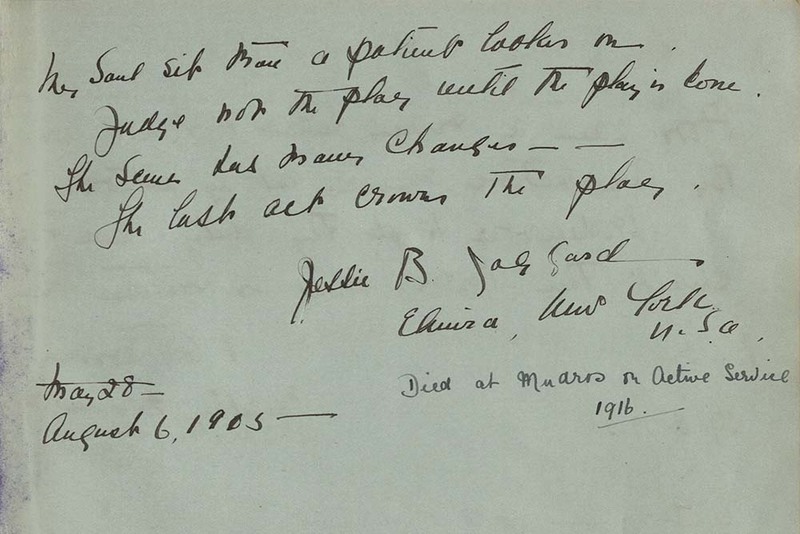 Carter applied to join the Queen Alexandra's Imperial Military Nursing Service (QAIMNS) on June 10th 1913. Less than a month later she was posted to the Military Families Hospital, Curragh, County Kildare. She was here during the ‘Curragh Incident’ in March 1914. British officers threatened to resign rather than fight the Unionists who were opposed to the new Home Rule Act. Carter would have been surrounded by the officers involved in the mutiny. It would have been an incredibly tense time on the Curragh Camp. A few months later, the First World War started and she was transferred to Colchester Military Hospital. Here she collected a few entries in her scrapbook from colleagues and patients. The hospital was quite small, with only 221 beds. During the war Colchester was gradually taken over by the wounded arriving on train, and being taken to one of the eight hospitals that were set up. Colchester would see at least 110,000 wounded men. From her scrapbook we can see that she was popular in Colchester, the news of her departure causes her colleagues to write well wishes in the pages. Carter boarded HMS Asturias on 18 June 1915, a few months after it had escaped unscathed from hitting a German mine. Carter worked on the ship for almost a year. During her time on board she travelled to Gallipoli, Salonica and Egypt. The HMS Asturias had been a Royal Mail Ship until 1914, when she was requisitioned by the British Admiralty a to become a Hospital Ship. As the ripples follow the ship at sea. From Carter’s photo album (images courtesy of her family) we can see what life was like on board. 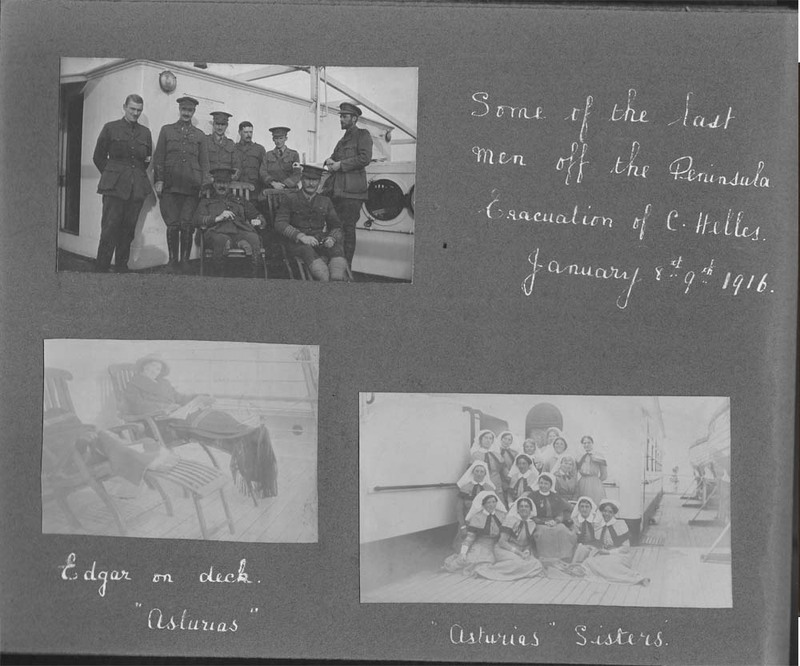 One page is labelled ‘en route’ and shows the two nurses and soldiers on board. These are the people Carter would have been surrounded by. Nurse Edgar you can see in the image also signed Carter’s scrapbook. She quotes a popular poem ‘life is worth living, because you smile’. Edgar seems to have been a particular friend of Carter’s, and appears multiple times in the albums. Scrapbooking was not the only way the nurses spent their spare time on the boat. In this image you can see the nurse in the foreground knitting, possibly socks for soldiers which was a popular pastime, and the nurse in the background writing a letter. Soldiers on board had a different pastime. They had set up cricket on deck, complete with nets to make sure the balls did not go overboard. Of course being on the Asturias was not all pleasant pastimes. The ship was a functioning hospital. Carter's dining room was converted into a ward, and her First-Class smoke room became an operating theatre. She had a total capacity for 896 patients. Carter kept a photo of ‘Ward C’ where you can see all the patients in their beds. There is one image of a particularly grisly back wound. It has no accompanying information about how the patient was injured, or whether they survived. It was not just the Allied soldiers who were receiving treatment - German prisoners were also tended to. They were most likely headed to one of the many internment camps dotted across Europe at this time. To meet, to love and then to part. 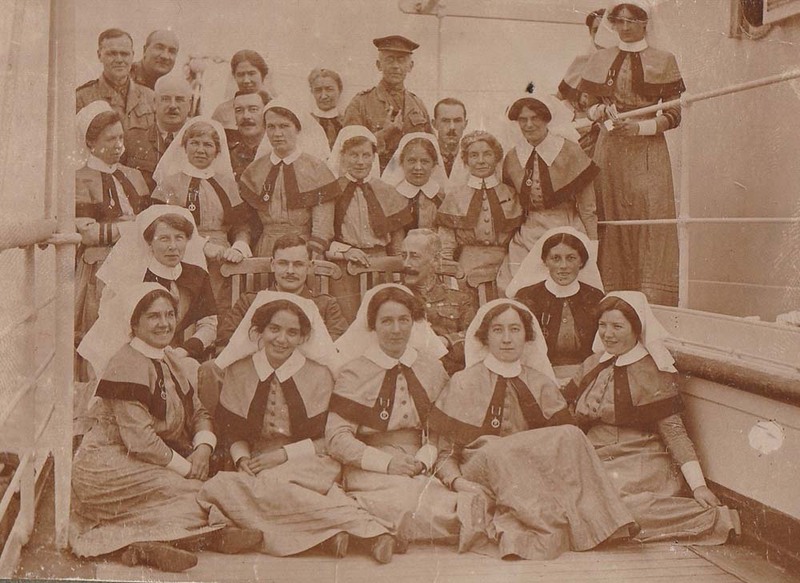 Aboard the Asturias there were also Canadian nursing staff. They seem to have left a particular impression on Carter as multiple entries in the scrapbook are from Canadians. There is also a corresponding photo in her album labelled ‘Canadian Orderlies Seasick’. Clearly it was not only the patients who felt unwell whilst at sea. Docking at Alexandria in August 1915 the Canadians left the boat, but not without leaving their names and addresses for Carter. Courtesy of University of Texas at Austin. From the Cambridge Modern History Atlas, 1912. 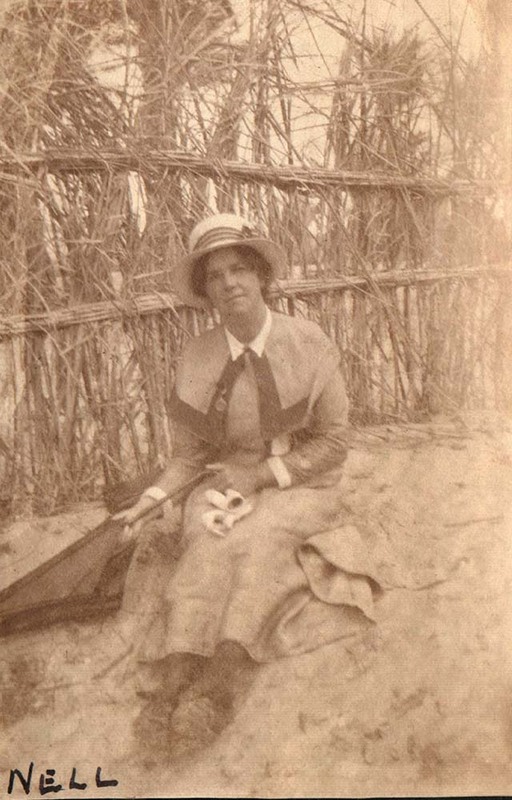 Her images show she travelled to Gallipoli, and explored ‘V’ and ‘W’ beaches. These were part of a push against the Ottomans from April 1915, a campaign that was still going on the year she was there. The fighting was particularly fierce, and casualty numbers were high. Whilst there, Carter saw the hard-won military defences, and took a photo of a soldier guarding a dugout. The Gallipoli campaign was disastrous, and it’s most likely Carter was there as part of the evacuation in January 1916. Some of the last men off the Peninsula Evacuation of C. Helles. 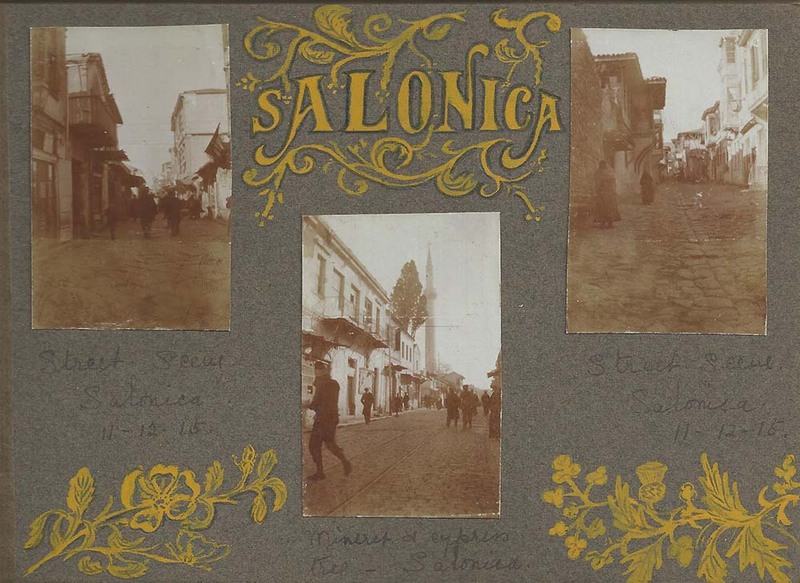 As well as travelling to Gallipoli whilst on the Asturias, her scrapbook and photo album show Carter went to Salonica, Alexandria and Malta. After nearly a year on board, Carter received a new posting. On 5 May 1916 she was sent to Abbeville, France. Although she did not know it then, this was very fortunate timing. In march of the following year the Asturias was torpedoed, and 35 of its crew killed. a dear friend. I hope. Carter was posted to various hospitals in Rouen; No 5 Stationary Hospital, No 1 Field Hospital and the No 10 General Hospital Surgical Unit. Whilst here Carter still had her scrapbook. The entries from her patients are very complimentary, whilst also being entertaining. 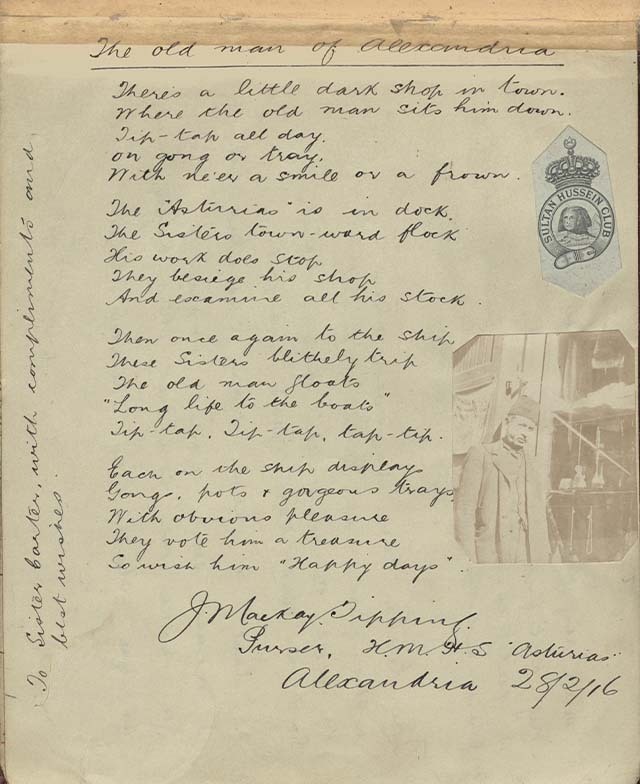 From the scrapbook we can see that poetry was a popular pastime, it certainly would have helped to whittle away the long hours in a hospital bed. Carter was moved to the No 41 Casualty Clearing Station (CCS), Abbeville. Amazingly, whilst at the CCS one of Carter's brothers, Harry, was attached to the same division. He was therefore able to visit her several times. In June 1917, whilst Carter was there, the Casualty Clearing Station was bombed. She survived, but several of her colleagues and patients died. After this incident Carter tendered her resignation. 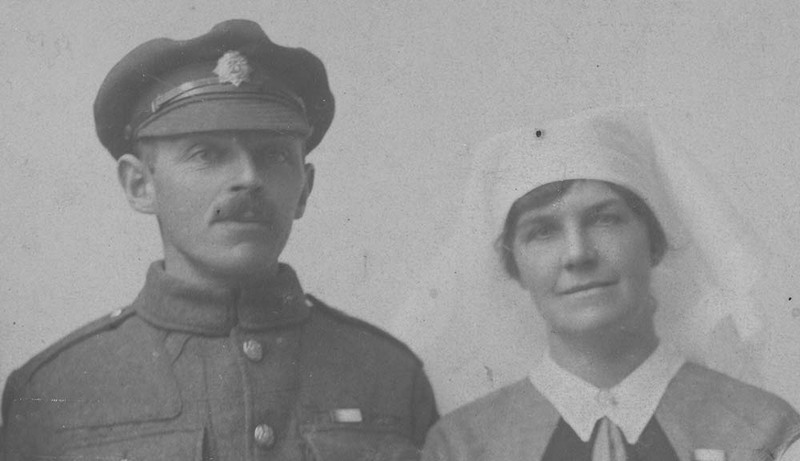 She requested to become a 'reserve' in early 1918 – but soon after she withdrew her request. The next place Carter is recorded as being is Villa Tino, a Sick Sisters Hospital in Le Touquet. It was Carter’s turn to experience being a patient in war-time. Villa Tino was a large chateau in Le Touquet’s forest. It had nine bathrooms, one of which was a sunken Roman bath complete with mosaics that was converted into the operating theatre. Carter was here until she was evacuated home in July 1918. She was diagnosed with 'Debility', a term then often used to describe nervous disorders. Carter remained 'Unfit for Duty' until after the war – her diagnosis was logged on her War Record as 'Nervous Breakdown with Heart Complications' and Pernicious Anaemia. After the war Carter carried on military nursing. She moved to Aldershot and nursed there in the Louise Margaret Hospital for Military families, continuing the work she had started before the war. In 1922 she was promoted to sister. Her scrapbook has no signatures from this time, it appears she used it only before and during the war. Perhaps she had a new one by the 1920s. The war did not put her off travel, and in 1926 she returned to Egypt. Here she worked in another Military Families Hospital, Mustapha, in Alexandria. She remained here for the next 5 years. Shortly after returning to England Carter sustained 'sprain injuries' from a fall whilst on duty in MFH Devonport. Following her recovery, it was recommended she stay in service at Devonport until her retirement. Carter retired on 2 March 1936, having completed 22 years and 239 days service. The Matron-in-Chief commented on Nellie's War Record that her service had been ‘Quite Satisfactory’. Ten years later, Carter is recorded as being admitted to Cane Hill Hospital, Surrey. Her doctor declared her ‘no longer able to manage her affairs.’ Her younger sister Rosa was granted Power of Attorney. Carter died in 1947 aged 65 years. The scene has many changes- - The last act crowns the play. Background image: Nurses on deck. Courtesy of Peter Carter and Family. Banner image: Nellie Carter. Courtesy of Peter Carter and Family. Carter on the bridge of the ship. Courtesy of Peter Carter and Family. Playing cricket on the HMS Asturias. Courtesy of Peter Carter and Family. HMS Asturias, 1915. Courtesy of Peter Carter and Family. 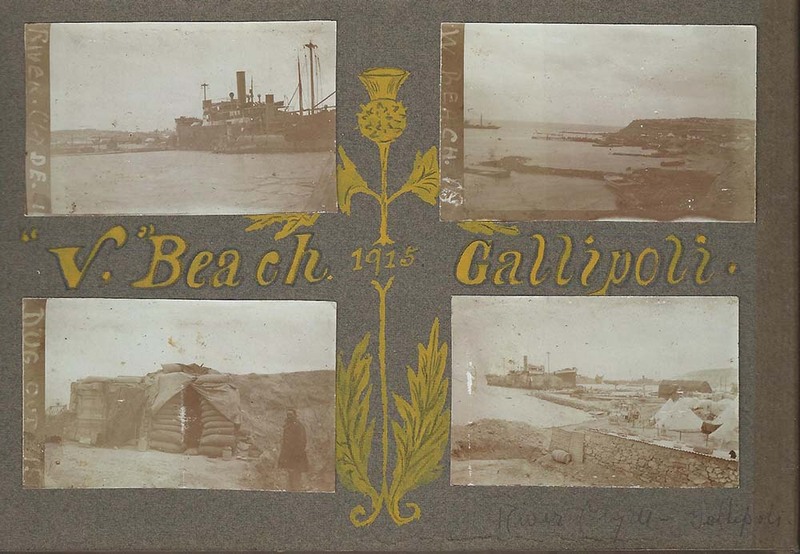 “V.” Beach Gallipoli, 1915. Courtesy of Peter Carter and Family. On board the Asturias. Courtesy of Peter Carter and Family. Salonica. Courtesy of Peter Carter and Family. Nurse on the deck of the Asturias. Courtesy of Peter Carter and Family. Nellie and Harry Carter. Courtesy of Peter Carter and Family. 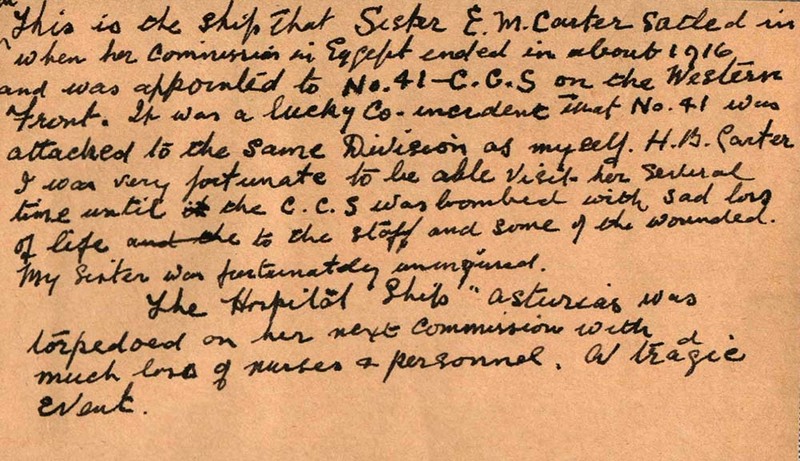 Harry Carter's Handwritten Account of the war. Courtesy of Peter Carter and Family. Nurses on deck. Courtesy of Peter Carter and Family. Nellie Carter. Courtesy of Peter Carter and Family.